After a good winter of racing cyclocross and MTB performance sessions the focus for me this year was British MTB XC series and championships, and the British Road champs...so a lot of travelling! 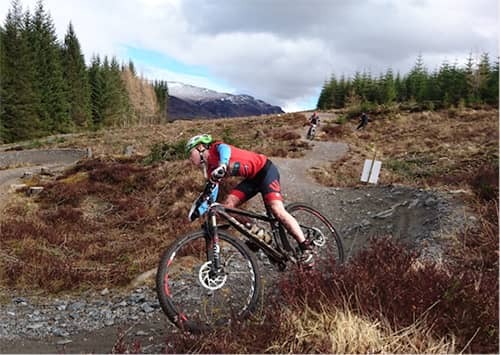 First race of the year was SXC Round 1 at Laggan at the end of March. SXCs have a very relaxed atmosphere and are a lot of fun. Laggan was basically a long climb to above the tree line with great views followed by a rocky, swooping descent. We had 2 laps and I was happy with my race taking 1st place. • Travel down on Friday to arrive late Friday evening. • Arrive in time on Saturday to sign on and then meet up with the other Scottish riders to do course practice between 12 and 2pm, usually with Paul Newnham but thanks to Iain Grant and Scott Lindsay for standing in when Paul couldn’t make it. • After practice clean up bike and make sure it’s ready for racing – have really appreciated Carl’s help with this when I had a couple of mechanicals. • Up early on Sunday – usually about 6am to allow time to eat some breakfast as the race start is 9am. • Arrive at course before 8am to get warmed up before racing. The Pembrey course was fairly flat with a couple of technical bits, although one section was changed after practice which meant I hadn’t ridden it. But those who had said I would be OK on it so I was ready to give it a go! I didn’t know what to expect from the race and was quite nervous. I got a gap at the start and managed to hold it till the end to take the win – my first ever at a National event! 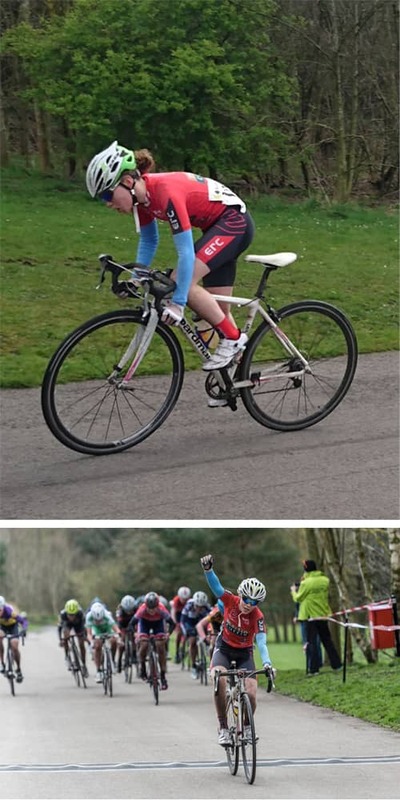 2 weeks later at the end of the Easter holidays was Round 1 of Youth National Circuit Series at Hetton – again I was quite nervous, not having done a lot of bunch racing, but the field wasn’t too big – around 30. The pace was quite steady to start with and there were a couple of small attacks but they came back. With a few laps to go Georgia Ferry attacked and I went with her – we got a gap and stayed away for a lap but were caught with 1 lap to go. I then put in an attack over the top of the hill and just kept pushing. I was really happy to get the win. 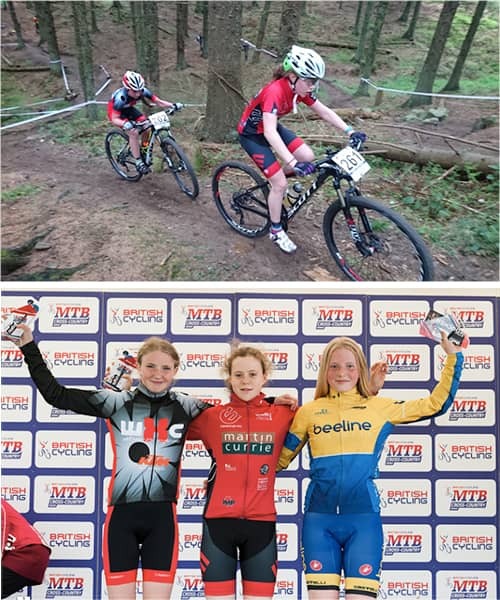 Next up was Round 2 of the British MTB Series in Plymouth – another Friday off school, to allow for the long drive down! I’d heard a lot about the Plymouth course being one of the most technical and was looking forward to it, but also very nervous. I walked the course with my brother Sean on Saturday morning to look at lines; then met up with the others to ride it at practice – even some of the B lines were quite technical and fun (although obviously longer) which was good as sometimes they can just be a long slog as a slower less risky alternative to the A line. Sunday morning and even at 9am in the morning it was quite warm – we had 2 laps of the course. I got a good start and quite soon 3 of us had a gap on the rest of the field. It was all very close for the first lap but on the 2nd lap I managed to get ahead on the second climb and pulled away, managing not to make any mistakes and get my 2nd win of the series! For the May Bank holiday we headed to Dunoon for a long weekend to race SXC Round 2. 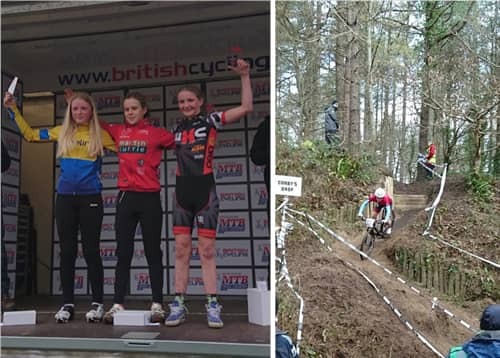 The weather was good, not too wet and I met up with friends to ride the course on Saturday – it was a long course so the U16 and U14 girls only had 1 lap in the race. It was a long climb to start followed by some fun technical single track through the trees followed by more climbing and technical descents, which following overnight downpour included wading across a stream which had been a trickle the day before! The finish was at the top of a steep fire road climb and I was happy to win overall youth girls race. I was looking forward to Round 3 of the National XC series in Dalby because it was not as long a journey as the others and we would be able to stay and watch the elite races on the Sunday afternoon. The Dalby course was good with a number of technical descents and steep climbs – again we had 2 laps of the course to race and 3 of us were together for most of the race, the lead swapping all the time. Towards the end of the race it was still very close between 2 of us. I came into the arena just ahead and sprinted for the line just holding off 2nd place. Really happy to get another win! My brother Sean also won the Youth race so he was happy too! 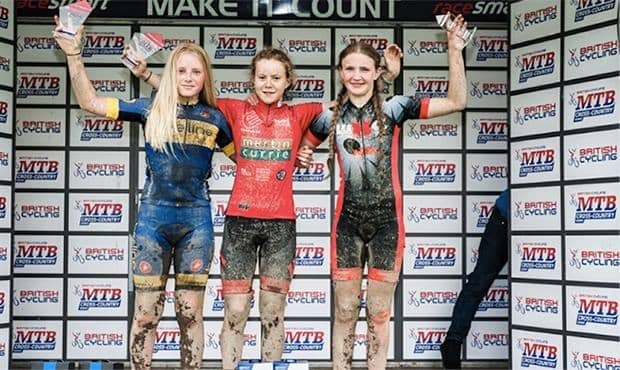 The elite races didn’t disappoint either - was great to see Evie Richards, Annie Last and the Scottish girls Lucy Grant, Isla Short, Kerry McPhee racing – really look up to all of them. And then to see such a great race between Grant Ferguson and Marco Fontana just topped off a great weekend. The following weekend was SXC Round 3 at Cathkin Braes. I was really looking forward to this as it was a chance to race on the course where the British Champs will be held in July. 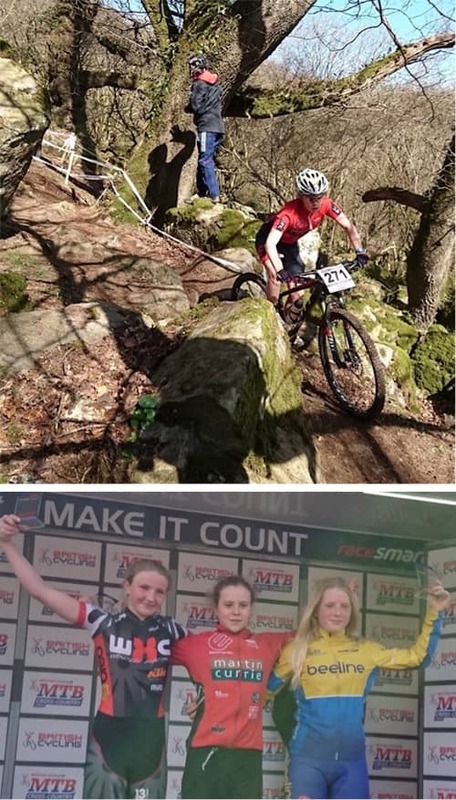 The U14 girls had 2 laps of the course – the race was going well for me until I came out of the woods at end of first lap and going up the rock garden I managed to drop my chain and jam it against the frame – I did manage to free it, eventually. I chased on for the 2nd lap and then messed up one of the technical descents and went flying!...rode the rest of the lap with squint bars which was weird! 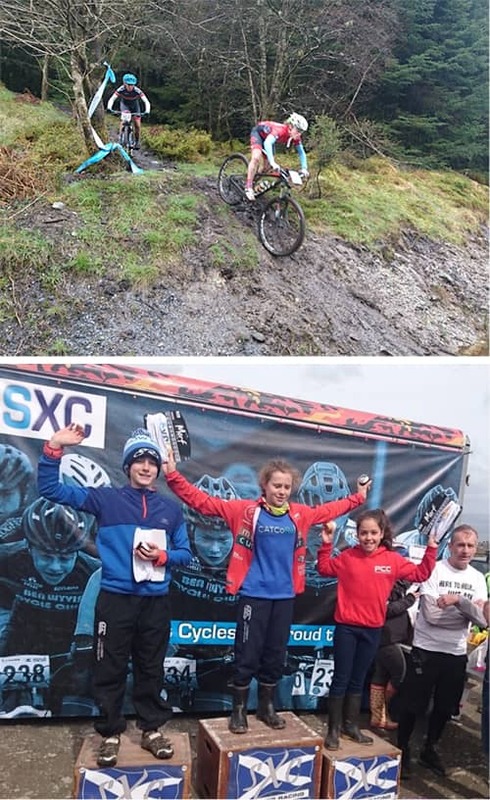 Won the U14 race and learnt a few things about dealing with mechanicals in the race (no tech assist in the SXC races). At end of May, six of us had entered the Glentress 7 as two teams. Mini Mechs was Polly Henderson, Katie Allan and myself. 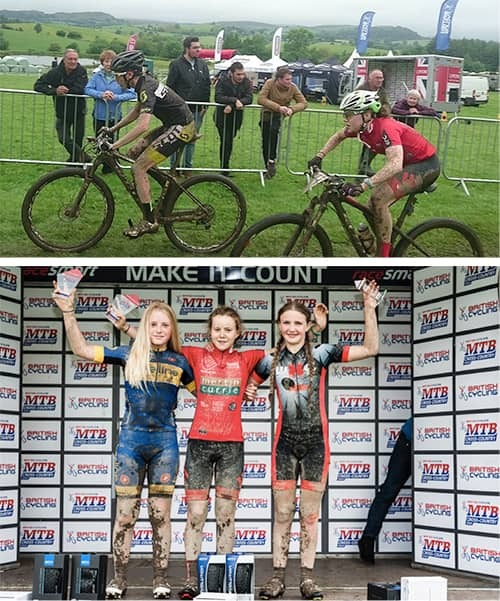 Mud Maidens was Anna McGorum, Emily Field and Megan Wilkinson. It is basically a relay of racing for 7 hours getting in as many laps as you can. It was great fun although I wasn’t thinking that way after my first lap where I ate dirt after a tumble at the bomb hole. Thankfully only grazed and bruised. Once I got my breath back, the kind marshal made sure I was OK and I was able to finish the lap. Then, once Polly and Katie had done their laps I’d recovered enough to do my 2nd lap. We each did 3 laps each. Mud Maidens won and Mini Mechs 2nd. And all in brilliant sunshine too! First weekend – no racing! What to do? Wakeboarding, Arthur’s Seat, diving, go ape – not a typical rest weekend but we did have friends over visiting so had to do something…brilliant fun and a great break from all the racing. Back to racing the following weekend in South Wales for Round 4 of British MTB XC series. I hadn’t been well leading up to this weekend so wasn’t sure if I would be fit to race but by Saturday I started to feel better so would just go and see how I felt. It was wet, and the course could only be described as slippy! At Saturday practice, most of it was rideable but with heavy rain overnight it was soooo muddy. The course was changed for us on Sunday morning (I think because of conditions) making each lap much shorter although 2 laps of the shortened course still took us 48 minutes in the slippy conditions. I think everybody had a slide out/crash at some point in the race. It was a very close race between three of us but on the 2nd lap two of us managed to pull away and get a gap. At the end it came down to a sprint for the finish - I was so happy to get it on the line. Four wins from four and really pleased that I’ve won the overall series!! Thanks always to Martin Currie and Braveheart Fund for supporting the Edinburgh RC Youth race team, Scottish Cycling for support at the national races, Bicycle Works for all the last minute fixes to my bike and Dougie at Edinburgh Bike Fitting.